GAINESVILLE, FL: Paul Brown (BS ISE 1984), with wife, Heidi (Shreves) Brown (BS ISE 1983), by his side, delivered the Robert Tyrie Benton Lecture, “Finding Success in Life and Career: Simple Lessons from a Corporate Executive,” to students, faculty and staff on Wednesday, April 24. 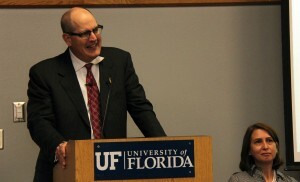 Brown has led a storied career with International Paper since his graduation from UF, but his career recently ended when he was diagnosed with an incurable and inoperable form of cancer. Brown joined International Paper (IP), the world’s largest paper and packaging company, with operations in 25 countries, in 1984, and has held various engineering, manufacturing, sales, supply chain, general management and vice president positions – in the United States, Europe, the Middle East, Africa, and Asia. Recently, he served as president of International Paper India, and executive chairman and CEO of Andhra Pradesh Paper Mills. Prior to these positions, Brown was president of International Paper Asia, in Shanghai. He also served as vice chairman of the IP-Sun Paper joint venture in Yanzhou, China and as chairman of the IP-Goldhawk joint venture in Beijing. 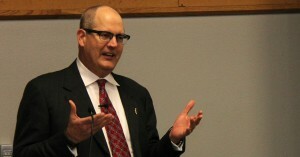 In the lecture, Brown reviewed his career with IP and then proceeded to provide advice for students looking to enter the workforce. He stressed having a work-life balance and having the confidence to succeed. 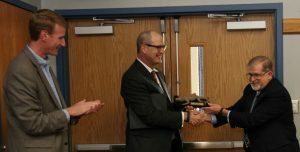 He also told students to have a healthy dose of skepticism, but to always be sure to communicate continuously and with transparency, collaborate, and influence others. He also said that a key to being a good leader was to care about those you work with — in fact, caring the most for the ones where it may be most difficult. He concluded that one should not be ready to take credit, but to dispense it widely. Brown earned his B.S. in industrial and systems engineering, with honors, from the University of Florida in 1984, and an M.B.A. from Drexel University in Philadelphia in 1989. During his undergraduate studies, he served as president of Tau Beta Pi, president of Alpha Pi Mu, and as student representative on the Dean of the College of Engineering Advisory Council. The Browns have two children. After his talk, ISE Advisory Board Chair Roger Madariaga presented Brown with the ISE Alumni Leadership Award.